Experiencethe stunning sceneries of allthree ofthe beautiful baysin theGulfofTonkin and explorethe amazingislands of Ha Long bay and Bai Tu Long bay on board TheAu Co. Enjoyan invigoratingvisit a peaceful floating villageinBaiTu Long Bay on atraditional rowingboat. While aboard, discover TheAu Co’s signaturefive elements cuisine, re-energizewithTai Chi, unwind on the sundeck or pamper yourself in theJacuzzi orwith aTraditional Vietnamesemassage. Experiencethe stunning sceneries of allthree ofthe beautiful baysin theGulfofTonkin and explorethe amazingislands of Ha Long bay and Bai Tu Long bay on board TheAu Co.
Enjoyan invigoratingvisit a peaceful floating villageinBaiTu Long Bay on atraditional rowingboat. While aboard, discover TheAu Co’s signaturefive elements cuisine, re-energizewithTai Chi, unwind on the sundeck or pamper yourself in theJacuzzi orwith aTraditional Vietnamesemassage. 12.30: Arrivein Halong Bay.Check-in at thecruisecentre. 12.45: Depart from Tuan ChauIsland, meet the onboard team and receivethesafety briefing. Co cruises leisurelytowards the VungHaarea. 15.30: Visit the Ban Chan Beachforswimmingandwateractivities. 17.30: Takepart inthe cooking demonstration. 18.00: EnjoyHappyHour (buy1 get 1 free). 19.15: Savour our fiveelementssignaturedinnerof Wood, Fire, Earth, Metal andWater while theboatis anchored forourovernight stop. 20.30: Relaxwithadrink atLanHabar or join our crewand trysquidfishingon thedeck. 07.00: Start the daywith a TaiChi class on thesundeckor enjoythebreathtaking viewsof the baywhile theshipbeginsslowlycruising. 07.30: Havebreakfast onboardwhile TheAu Co cruisesinBaiTu Long Bay. 17.00: Makethe most of an extendedHappyHour (buy1get 1 free). 19.15: Trythe barbeque buffetin the restaurant while theboat is at anchor. 20.30: End the daywithadrinkatLan Habar orjoin ourcrewand trysquid fishingon the deck. 21.00: Join our kitchen staff forthefruitcarvingsessions. 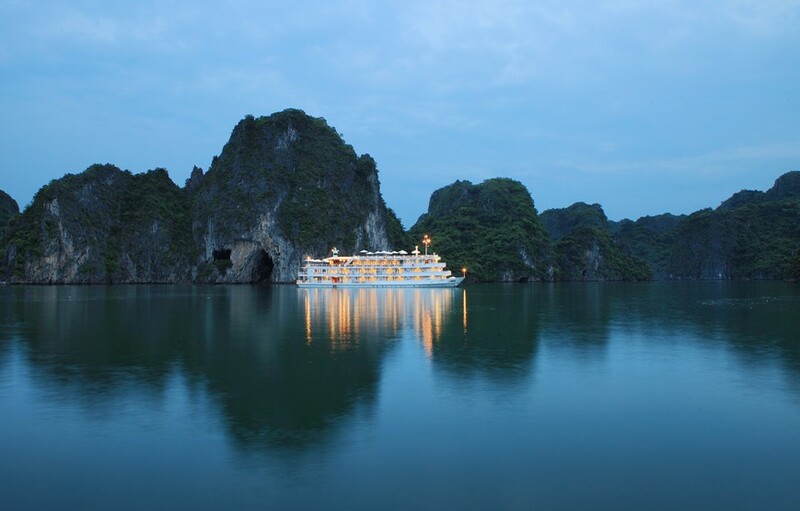 06.30: Start thedaywith a TaiChi lesson onthe sundeck or enjoythe breath-takingviews ofthe baywhile TheAuCo cruises leisurelyin Bai Tu Long Bay. 07.45: Visit VungViengfishingvillagebytraditional bamboo boat. 09.00: Prepare for check out:passenger’s bagsmustbeputin the corridor. Port authorities insist on advance registration including full name, gender, date of birth, nationality, passport number and visa expiration date. At check-in a valid passport is required. Port authority may deny boarding if these conditions are not met. What do you think of Âu Cơ Cruise?